1. First of all whisk together the soy sauce, water, sugar, honey, Worcestershire sauce, vinegar, olive oil, onion powder, garlic powder, and ground ginger in a large bowl. Pierce steaks several times with a fork. Marinate steaks in soy sauce mixture for at least 2 hours. 2. And then cook the steaks in a hot skillet, wok, or hibachi over medium heat; 7 minutes per side for medium. An instant-read thermometer inserted into the center should read 140 degrees F (60 degrees C). 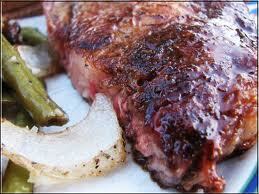 Enjoy the rib eye steak marinade with teriyaki sauce ! Enjoy !